Upset Hindus are urging Santiago (Chile) based fashion label “La Pituka” for immediate withdrawal of underwear carrying image of Hindu deity Ganesha; calling it highly inappropriate. Distinguished Hindu statesman Rajan Zed, in a statement in Nevada (USA) today, said that Lord Ganesha was highly revered in Hinduism and was meant to be worshipped in temples or home shrines and not to adorn one’s crotch. Inappropriate usage of Hindu deities or concepts or symbols for commercial or other agenda was not okay as it hurt the devotees. Zed, who is President of Universal Society of Hinduism, also urged “La Pituka” to offer a formal apology, besides withdrawing Lord Ganesha underwear. Zed further said that such trivialization of Hindu deities was disturbing for the Hindus. Hindus were for free artistic expression and speech as much as anybody else if not more. But faith was something sacred and attempts at trivializing it hurt the followers, Zed added. 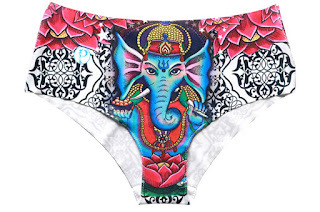 “La Pituka” seems to be currently selling two Lord Ganesha underwear on its website— “Pantaleta Ganesha” and “Bikini Ganesha”—which Hindus are objecting. “La Pituka”, launched in 2011, claims to use Chilean microfiber fabric, and sells women’s and men’s clothing and accessories. Its Mission translates as “Make a Difference”.